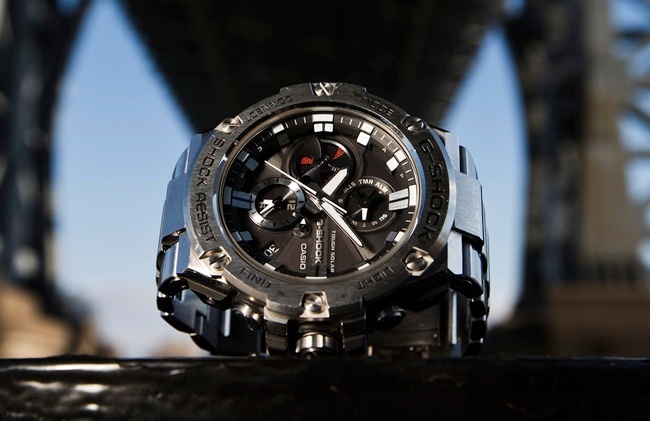 The G-SHOCK G-STEEL Indestructible Watch - GSTB100D-1A | Valet. Back in 1981, when Casio began developing its first G-SHOCK watch, the goal was rather simple: make a more durable timepiece. They were aiming for a reasonably priced watch that was able to withstand 10 atmospheres of water pressure, survive a ten-meter fall and get ten year's worth of battery life. Two years (and 200 prototypes) later, Casio engineer Kikuo Ibe was struck with inspiration while passing through a local playground. He watched a simple bouncing rubber ball and realized that the center of the ball never suffers the same impact as the ball's exterior. It was there on that playground that Ibe envisioned the shock-resisting system that is the signature of all G-SHOCK watches. 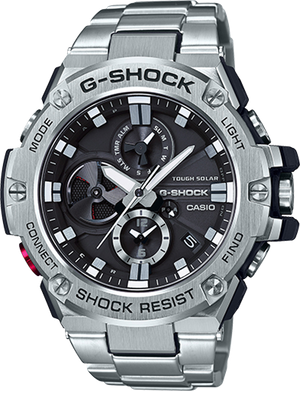 The unique G-SHOCK case is essentially hollow, with the vital timekeeping module protected at key points inside by soft gel cushioning. The shape was designed to protect the buttons and face from impacts from any direction. Even the straps are specially engineered to isolate the watch and protect it from dangers associated with falls, drops, vibrations and other traumas. The resulting case, first crafted from a rugged resin, not only made it a stubbornly tough timepiece, but it gave the watch a rather distinctive look—an aesthetic that was almost aggressive. But it was that bold style, along with its intense durability, that helped the G-SHOCK become something of a streetwear icon. 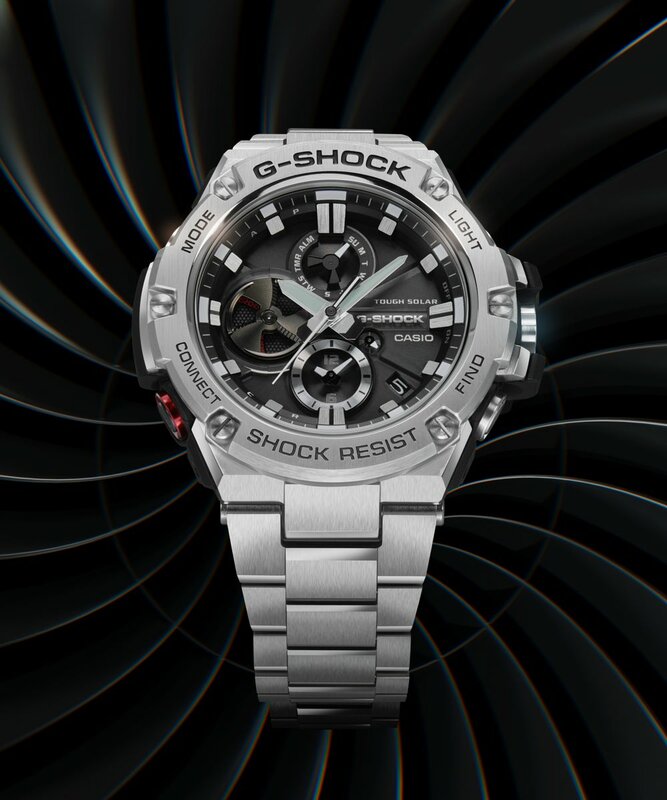 Three and half decades later, G-SHOCK continues to make watches that are as striking as they are tough, but the brand is also growing up with a more refined lineup crafted from stainless steel. And the G-STEEL collection isn't just updating the exterior. 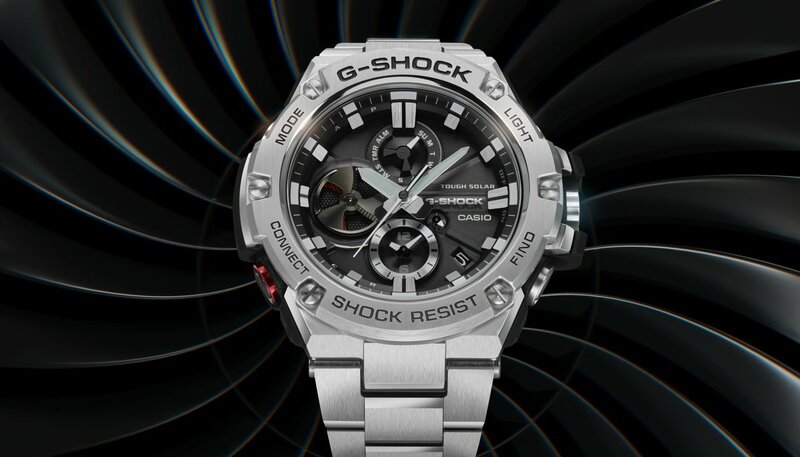 Take the GSTB100D-1A, one of their latest additions to the G-STEEL range. Underneath the sleek, aviation-inspired metallic finish is a range of high-tech smart features. Press the red button located at the 8 o'clock position and you'll be instantly connected to an app on your smartphone via Bluetooth. You'll be able to check your power levels, set alarms and effortlessly change time zones via their highly accurate internet time server. This connectivity also means you'll be able to use the watch to locate a misplaced phone. And since it's synced up with your phone's GPS, it can automatically adjust to the correct time when you travel. In addition to the smart features, the GSTB100D-1A comes equipped with some impressive traditional watch attributes as well. The chronograph can record times up to 24 hours, there's a second time zone display and a fully automatic date display with day indicator. What's more, the quartz movement is powered by an impressive solar battery, which eliminates any need for battery replacement. It all adds up to an incredibly capable and durable watch you can wear in any situation, with anything in your wardrobe and know you've got the right watch on. to today's high-tech smart featured timepieces.